Brennan tells Colorado Democratic Sen. Mark Udall he has no intentions of running for governor of New Jersey. You're off the hook, Chris Christie. Florida Republican Sen. Marco Rubio asks Brennan who should take over terrorist detention, if not the CIA. Brennan: The U.S. military, which retains an active interrogation program, the FBI, and our international partners -- that's where most of the interrogations are taking place from terrorists taken off the battlefield. Rubio presses Brennan on where these detainees should be held. "There are many separate options, including foreign partners' detention facilities, or "put them on a naval vessel and interrogate them for an extended period of time." "Each case requires a very unique and tailored response," including taking them to facilities such as Guantanamo Bay. Priority one is taking them off the battlefield. Priority two is garnering intelligence. Priority three is preserving information to prosecute them, Brennan says. What Brennan is discussing will come up next week in Guantanamo Bay for the hearings for Khalid Sheikh Mohammad, et al. Defense attorneys are trying to establish if these enemy combatants, some of whom have been held for years, were captured as war criminals while the U.S. was at war. If this is the case, when did this war begin? Among these detainees are those related to the USS Cole bombing in 2000, and for incidents from even earlier. A mysterious government body -- yet unnamed -- gave itself away at the hearing last week by blacking out the live feed when the attorneys began discussing classified material. Brennan echoes lawmakers sentiments that sequestration is dangerous. With less than a month until $1.2 trillion in automatic budget cuts hit, Brennan says that he is not going to "slice" the budget across the board. 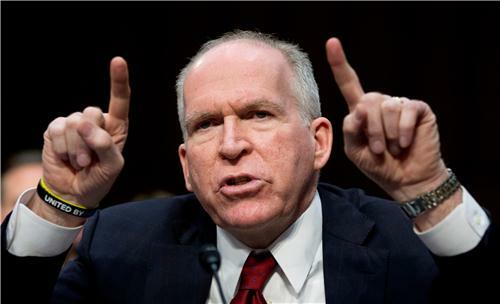 "It is going to have a devastating impact," Brennan warns. This exchange between Feinstein & Brennan is a perfect example of a trampling of due process in the US. US Capitol Police arrest 8 demonstrators who disrupted opening statement of DCI director nominee John Brennan at his confirmation hearing. Burr says he will be brief in his remarks toward the end of the hearing. "I notice you're on your fourth glass of water and I don't want to be accused of waterboarding you." Wyden presses Brennan on the white paper, and whether these targeted Americans should be allowed to surrender. Americans who join al Qaeda know “full well” they are taking on the mantle of an enemy against the United States, Brennan said.